MRI equipment combines computer technology, a magnetic field, and radio waves to produce a two-dimensional image of a “slice” of the patient’s anatomy. This process is radiation free, and the radio waves are harmless. Unlike CT scans and x-ray images, MRI scans produce highly detailed images that are adept at identifying soft tissue pathologies. Another advantage of MRI is that it can produce images in different anatomical planes, enabling study of the anatomy from different angles. Since we preform our own warranties and service, we make sure to choose only top quality used imaging equipment for purchasing. This helps to reduce possible service problems down the road. When the final day comes for the MRI Scanner at its current location, Nationwide crews perform final testing on the equipment before we remove power from the unit. These tests are to ascertain the condition of the system before it is removed and transported. Some of the items Nationwide checks are the Cryogen levels, image quality, installed options, disk, gradients, console, table, coils and magnet operations. Once these tests are performed and documented, the unit is powered off and ramped down. Power is removed and the cables are disconnected and labeled, then neatly packed. All major components are unbolted from the floor and pad wrapped to protect the finish of the components. OEM dollies are attached to the base of the major pieces and removed to be own transported by a modern air ride semi trailer or one of our own air ride trucks. The MRI scanners are strapped down within the trailer to keep them protected. 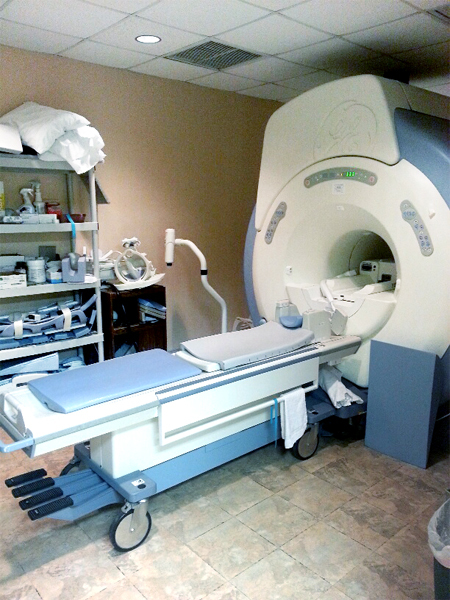 Once the MRI equipment arrives at the Nationwide facility it is again inventoried. The covers of the pieces are removed from the system and tagged as to their location and system number. The covers are taken to the cosmetic repair center. There they will be prepped, masked and painted to the OEM colors or one of those specified by the customer. The major components are cleaned with a variety of processes that sterilize, cleanse, and prepare these devices for cosmetic’s and operations. There are then moved into a testing bay where they are cabled up and power applied. The system is then again tested to determine if all manufactures mandatory upgrades have been performed, system operational characteristics, software updates, error log review, bearing operations, noises, fan operation, coil operation, image quality, styles of disk drives, tape systems, phantoms, etc. Any item that does not exceed the manufacturers specifications or are close to failing are replaced. There it will be professionally installed by one of Nationwide’s crews. Once installed a professional MRI trainer will provide applications on the methods available and proper operation of the MRI scanner.